Twelve years ago, in April 2002, the Food and Drug Administration approved Botox Cosmetic for use in treating the glabellar lines, more commonly known as the frown lines, between the eyebrows. Since gaining the initial approval from the FDA, Botox has been a popular pick for patients across the US. It was the most popular, non-invasive procedure among women and men in 2013, according to the American Academy of Facial Plastic and Reconstructive Surgeons. Botox was second most commonly performed procedure among women in 2013 (rhinoplasty was the first). Although there's no doubt that Botox is a popular option for people who want to reduce the signs of wrinkles and aging on their face, there's still a lot of misinformation about it out there. 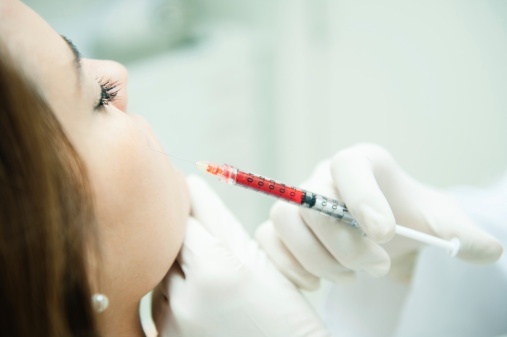 In honor of the cosmetic treatment's 12th birthday, here's the full scoop on Botox. One of the big differences between Botox and other injectables, such as Radiesse or Juvederm, is the type of wrinkles it treats. Injectable fillers are meant to treat stationary wrinkles, or wrinkles that develop as a result of volume loss in the face. Botox is meant to treat wrinkles that develop due to movements of the facial muscles. The FDA approval in 2002 gave the go-ahead for treating frown lines. An additional approval in September 2013 gave the go-ahead for doctors to use Botox to treat crow's feet, the wrinkles that form on the corners of the eyes due to squinting. Although Botox Cosmetic is meant for treating wrinkles, the substance itself has a number of other medical uses. It was originally approved by the FDA to treat cervical dystonia, a condition that causes painful spasms in the muscles of the neck. Botox can also help relieve migraine pain and stops excessive underarm sweating. The effects of a Botox injection don't last forever. In most cases, a Botox treatment lasts for about four to six months, though results can vary from person to person. While the results from injectable fillers are immediately visible, it can take a few days for results to appear after a Botox injection. In some cases, the wrinkles will become progressively less visible over the course of 30 days or so. Contrary to Popular Belief. . .
Botox doesn't give you a "frozen" face. Although the injection works by preventing nerve impulses from traveling to the specific facial muscles, you are still able to move the muscles on your face. You'll be able to smile or frown, if needed after treatment. The results from a treatment should be subtle. The treatment is safe, if you see an experienced, trained doctor. But, there is the risk of side effects and other things to be aware of when considering a Botox injection. You might have some redness in the injection area or swelling and bruising. You want to avoid rubbing the treated area after the injection, as doing so can cause the toxin to spread, leading to blurry vision or a drooping eyelid. Compared to other plastic surgery treatments, Botox injections are quick and relatively painless. Usually, the injections take less than a half an hour and many people are able to go back to work or other regular activity right away. The needle used to inject Botox is very tiny, so the pain felt during a treatment is minimal. If you're concerned about pain, the doctor can use a topical anesthetic to numb the area. Choosing the right person for your Botox treatment is a must. In the right hands, it's safe and effective. In the wrong hands, the risk for complications increases. Pick a trained and experienced medical professional, such as a facial plastic surgeon, for best results. For your safety, only get your injections at a medical practice, not at a friend's "Botox party." Boca Raton facial plastic surgeon Dr. Nathan Nachlas has been in private practice since 1987. He has treated many patients with Botox Cosmetic and is happy to answer any questions you might have about the procedure. What Are the Symptoms of Sinusitis in Florida?